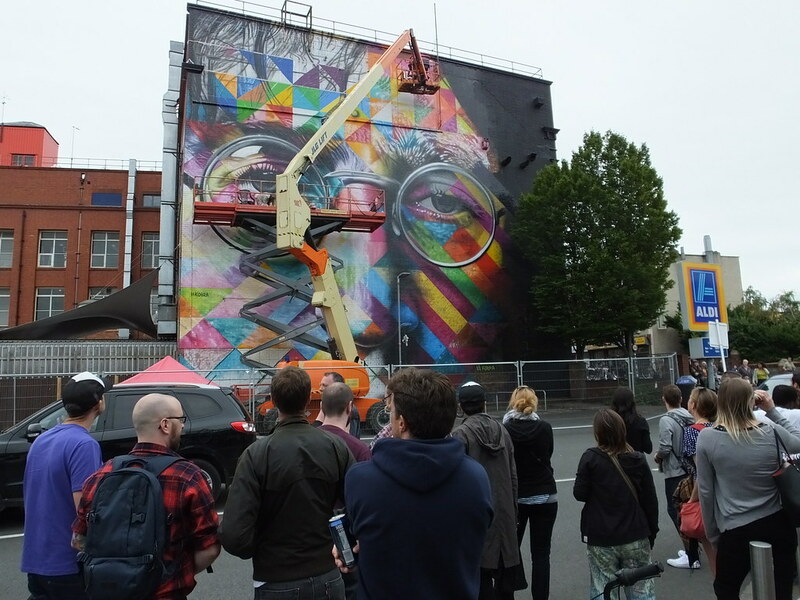 Around 450 artists from all over the world descended on the city of Bristol to take part in Upfest – Europe’s largest street art festival held across a weekend in July. 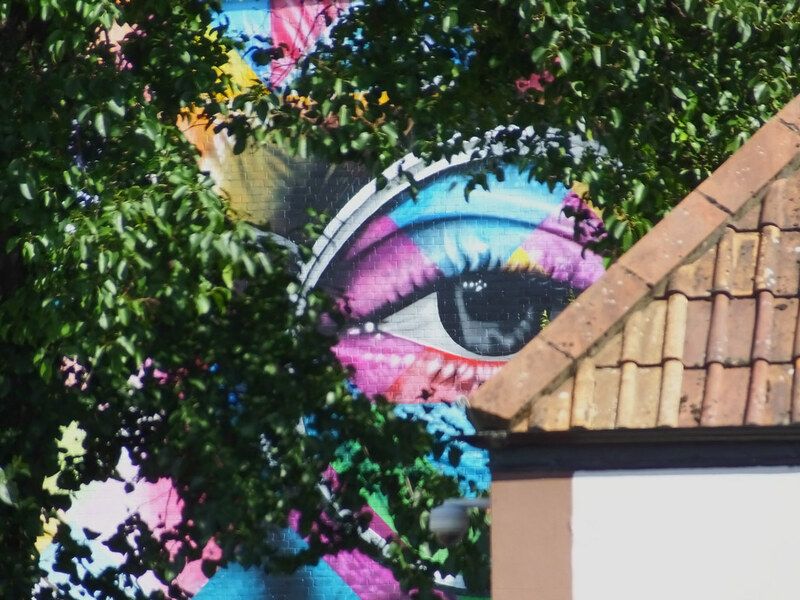 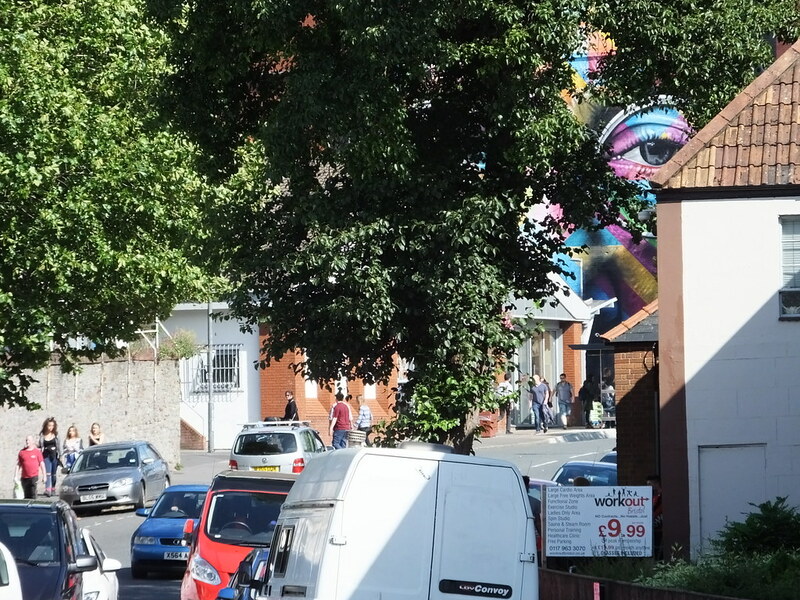 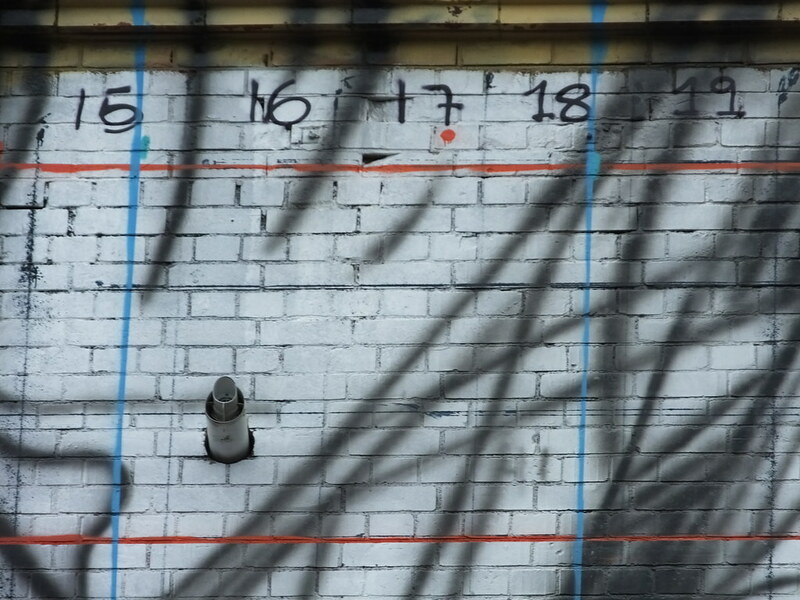 The suburbs of Bedminster and Southville were transformed as artists painted around the south of Bristol including this large wall just off the main street. 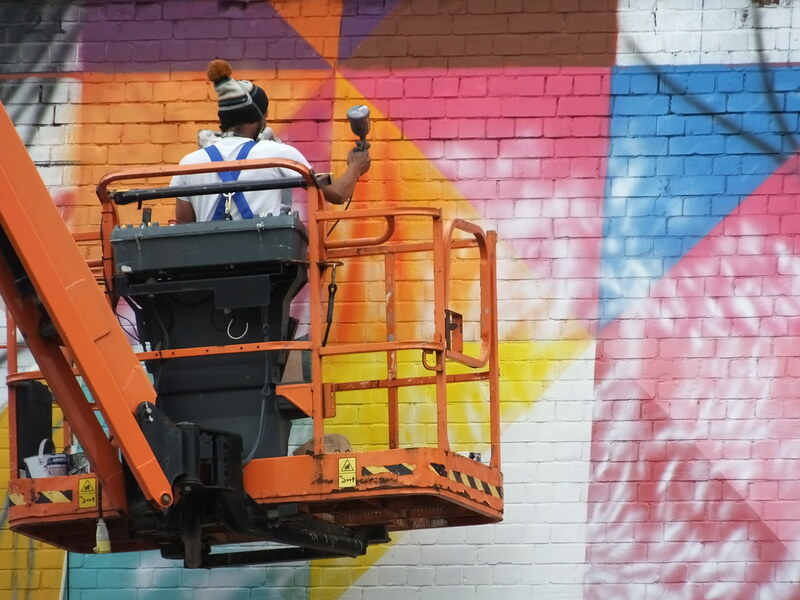 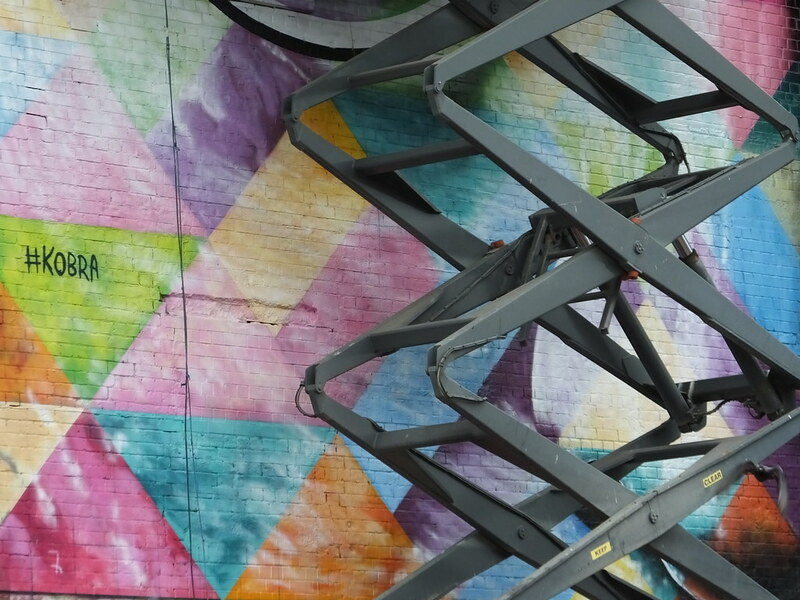 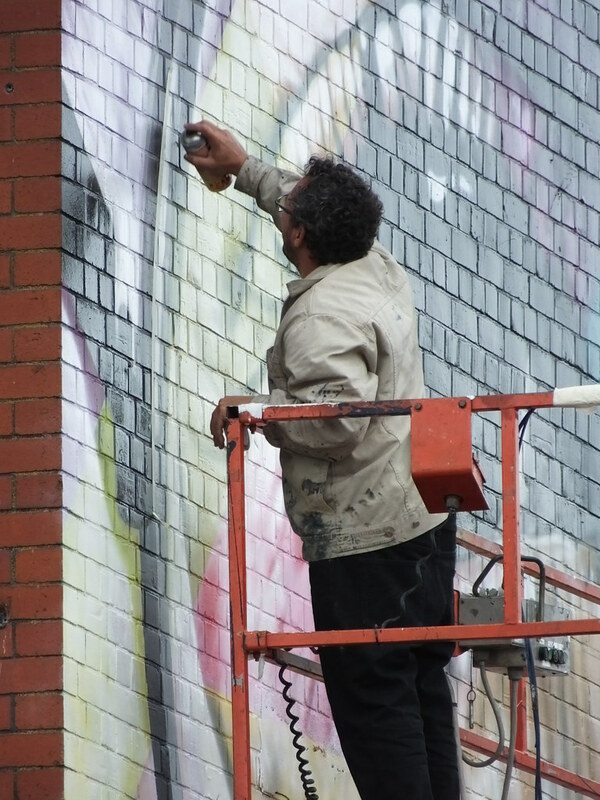 As last year’s masterpiece from Cheo was slowly covered up the fantastically colourful new masterpiece soon began to take shape. 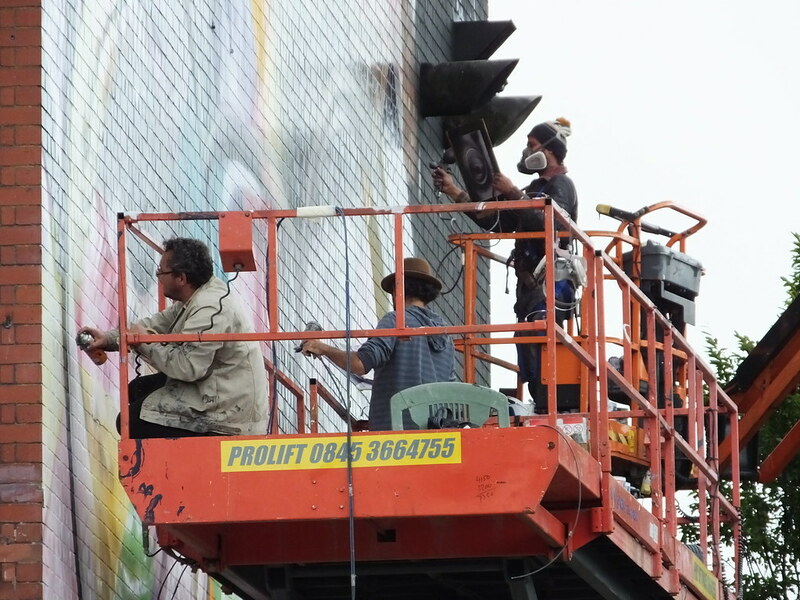 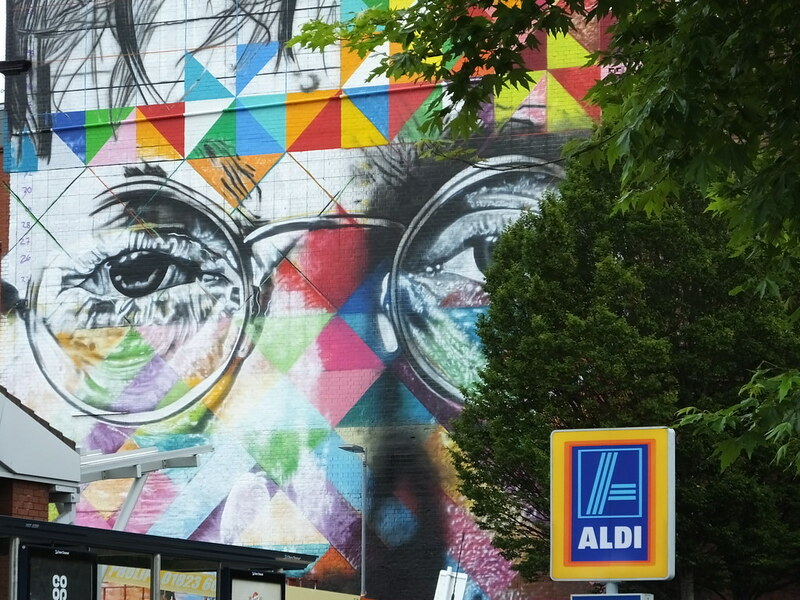 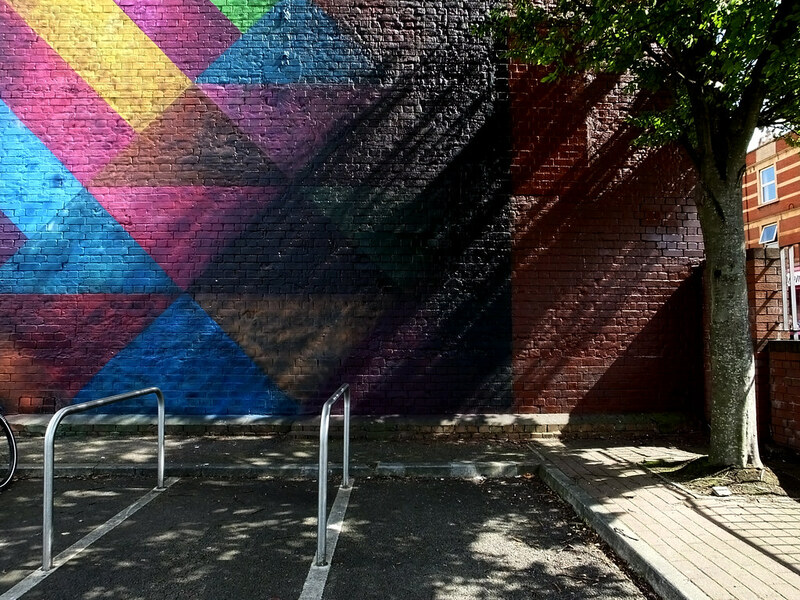 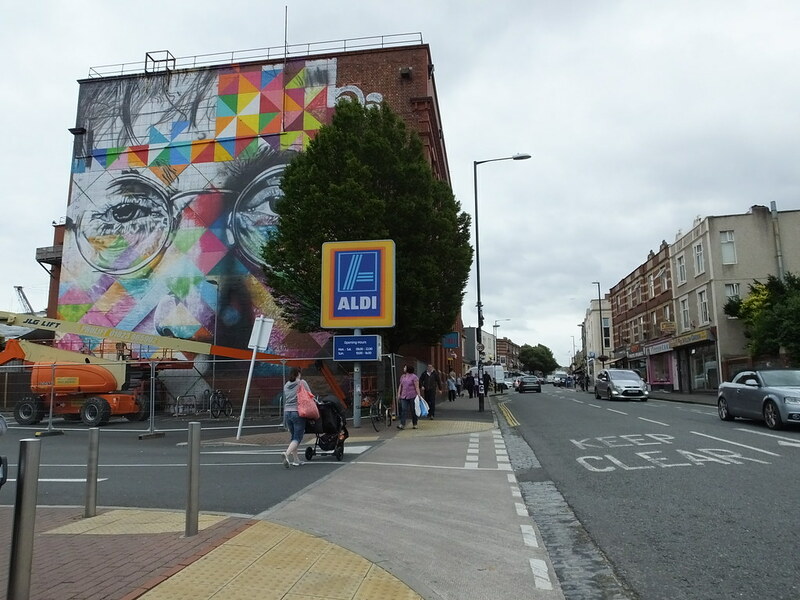 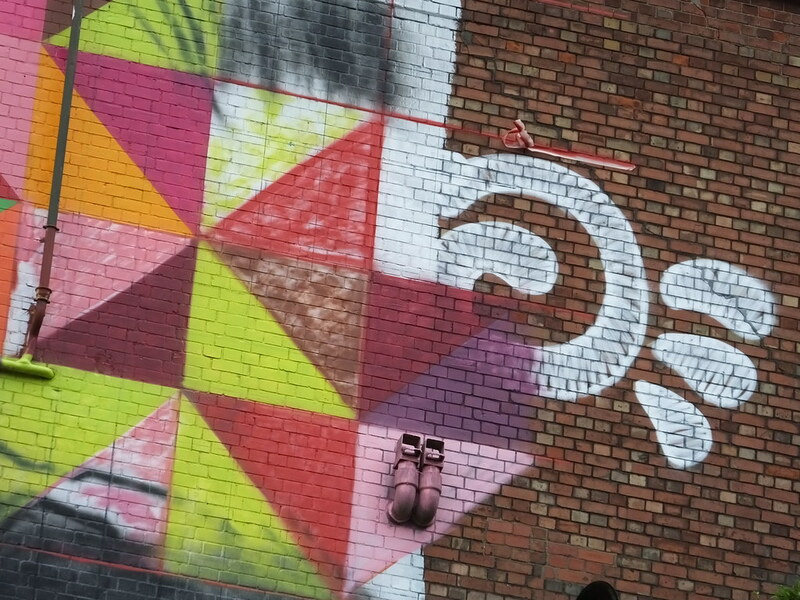 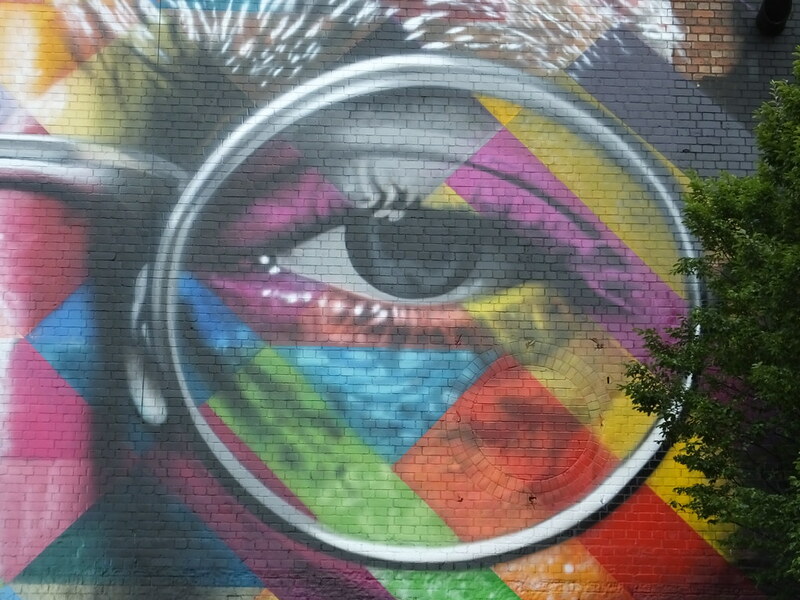 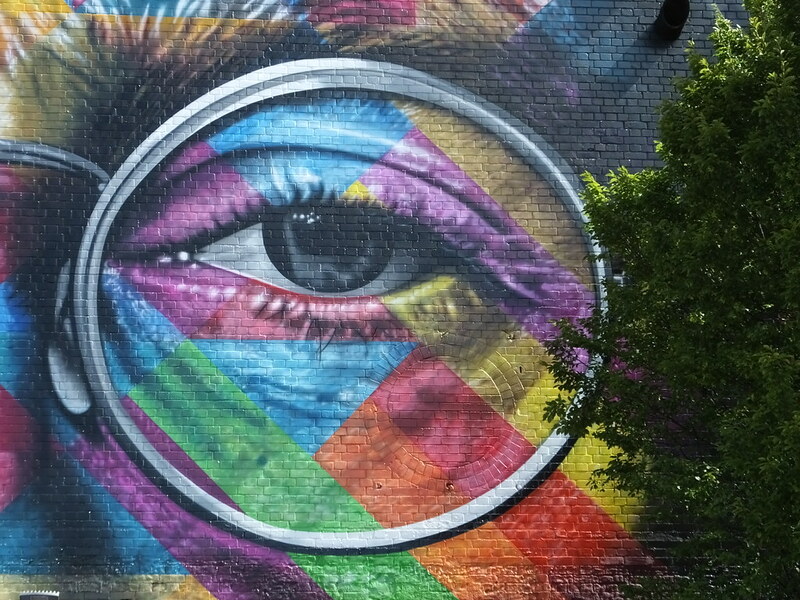 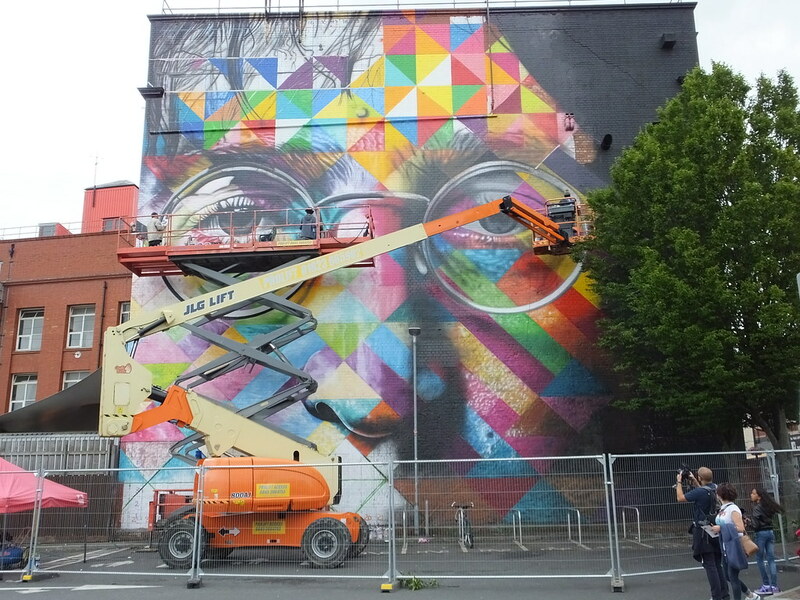 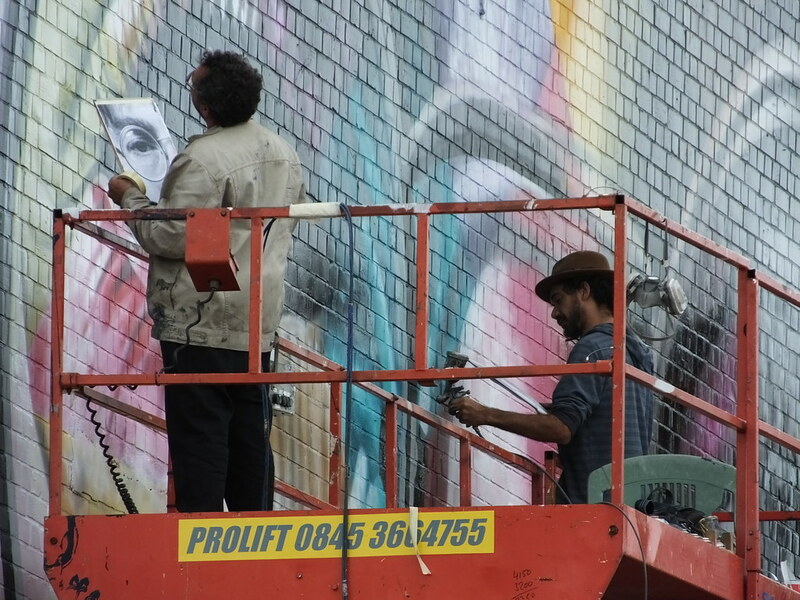 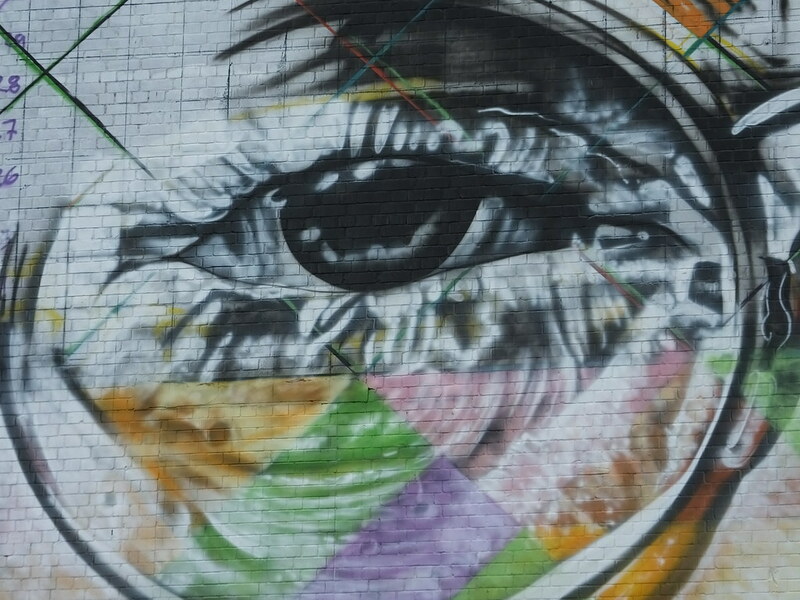 Hailing from São Paulo in Brazil, Eduardo Kobra painted one of the largest and most colourful murals on a bricked wall opposite the local Aldi supermarket in Bedminster. 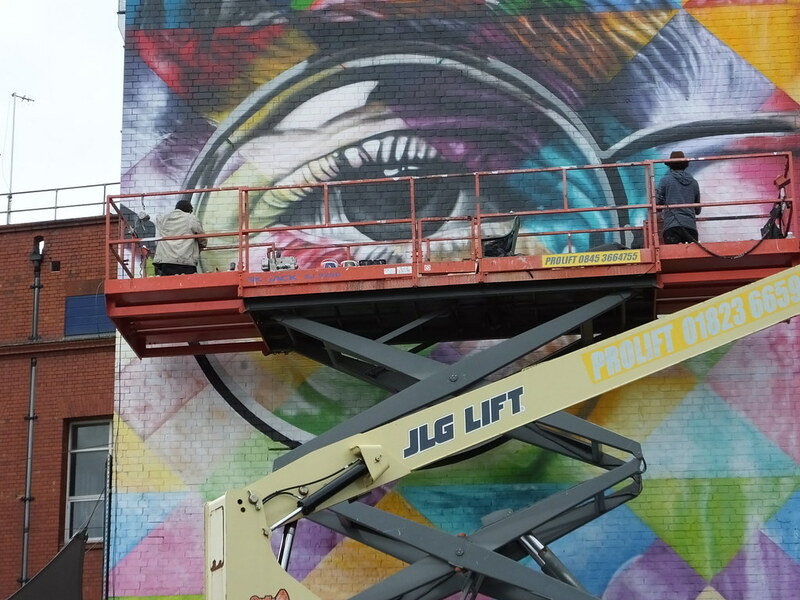 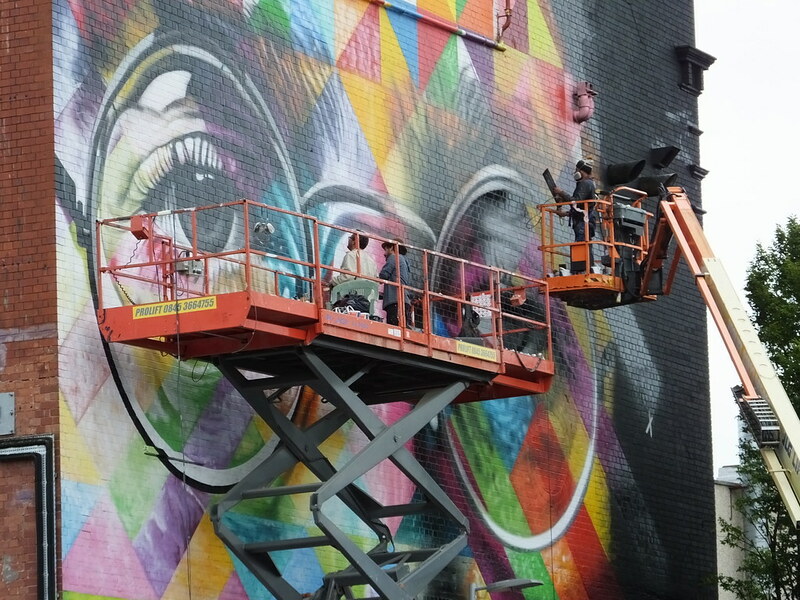 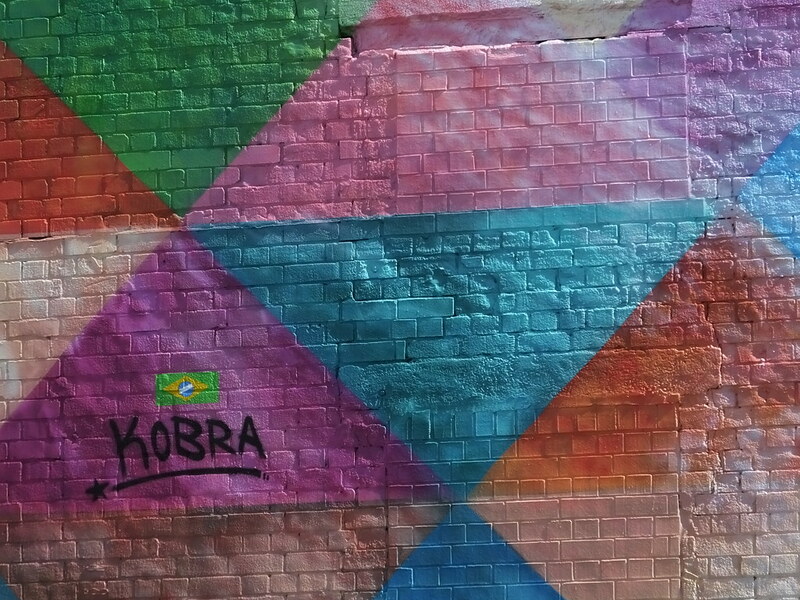 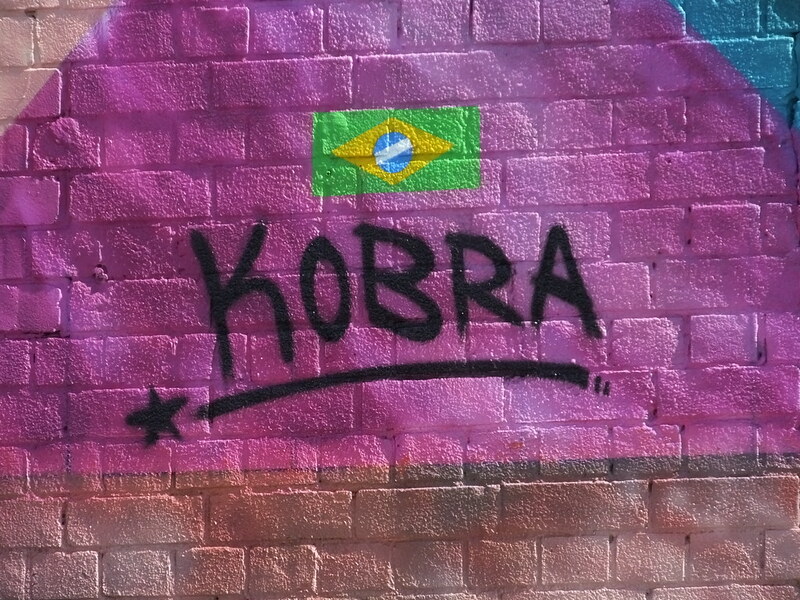 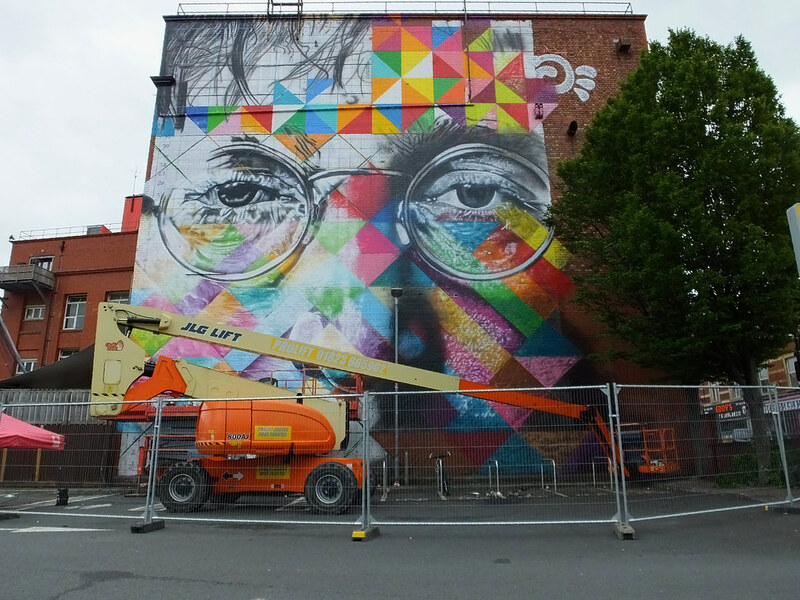 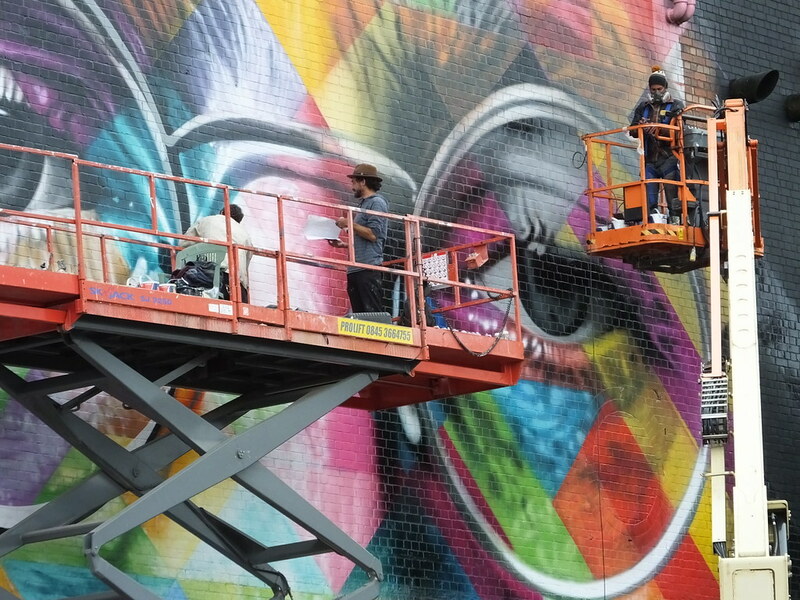 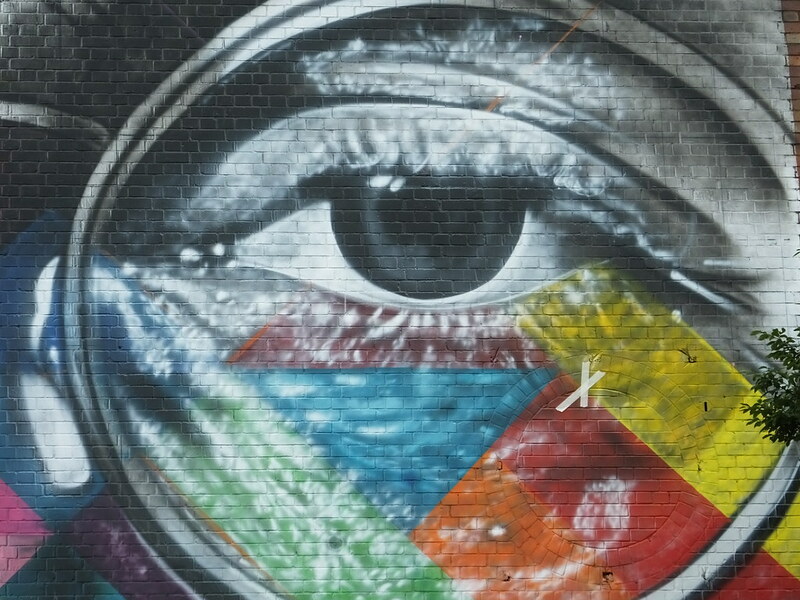 Famous for travelling around the world and unleashing his colourful creations everywhere here Kobra was ably assisted with people, a scissor lift and even a cherry picker as they all painted among a bustling car park with shoppers constantly snapping away at their progress. 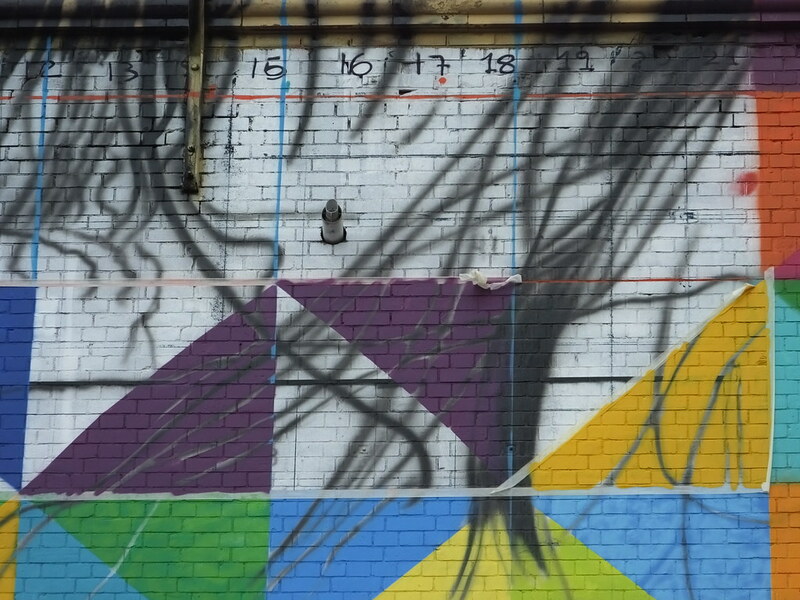 It’s always interesting to see the hard work and preparation that goes into a piece shown here with an elaborate grid pattern and a numbering system to help translate the initial drawings from paper to this huge canvas. 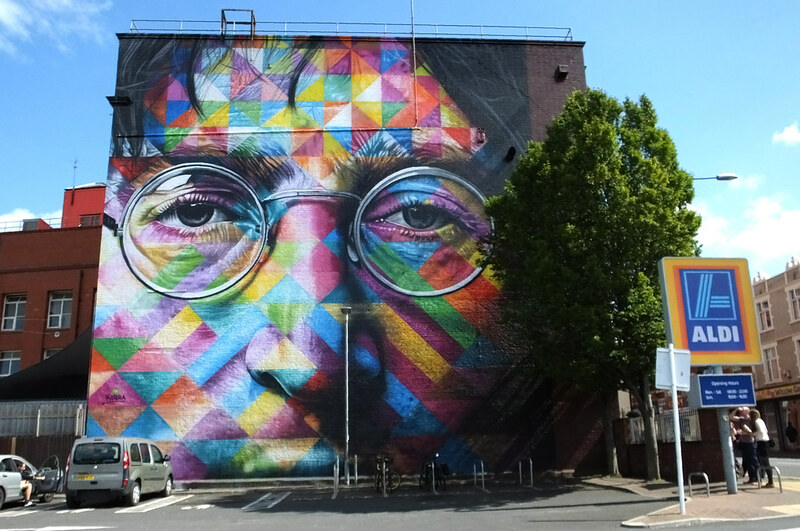 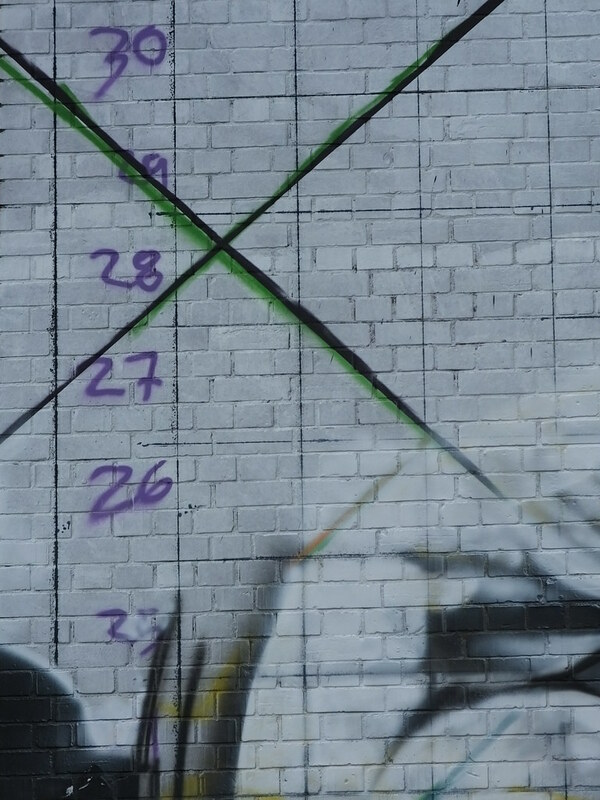 The legendary John Lennon was painted on the wall over many days where it featured his iconic glasses. 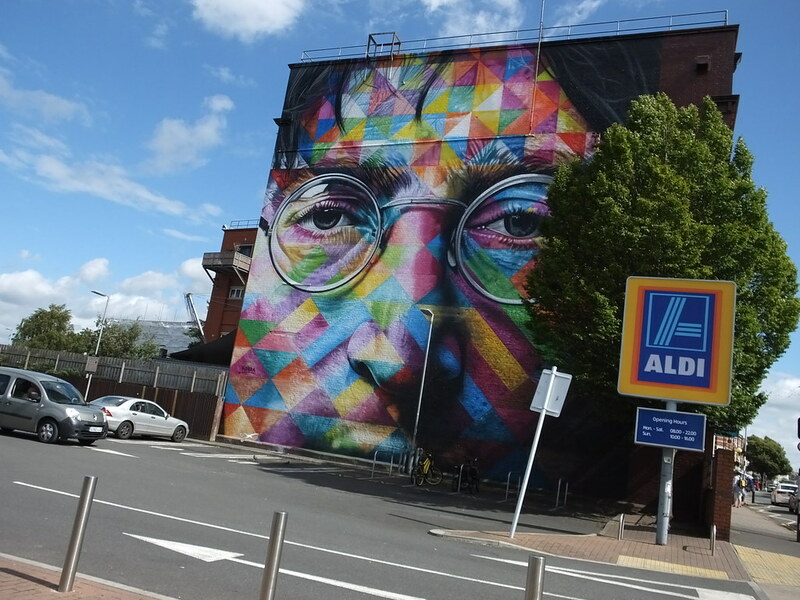 Some people did seem to question whether it was actually Harry Potter or even Noel Gallagher! 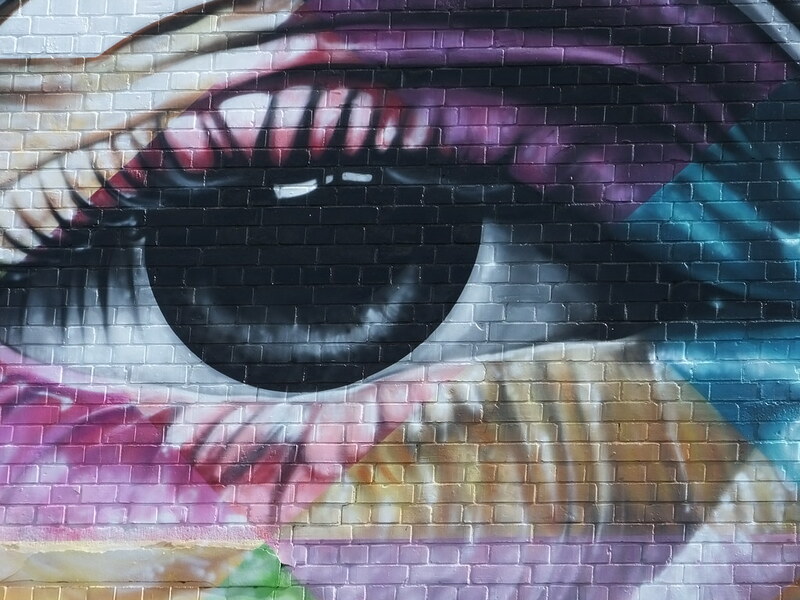 It’s great to watch the development, layering and detail that has gone into the piece – totally illustrated by the change in the eyes here. 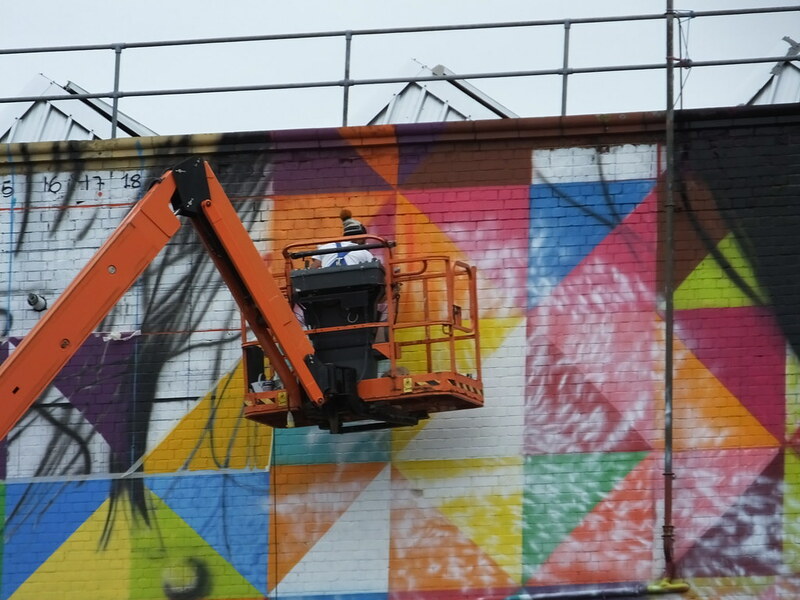 A colourful geometric pattern has brought the whole piece together and could be seen from a fair distance down the road too. 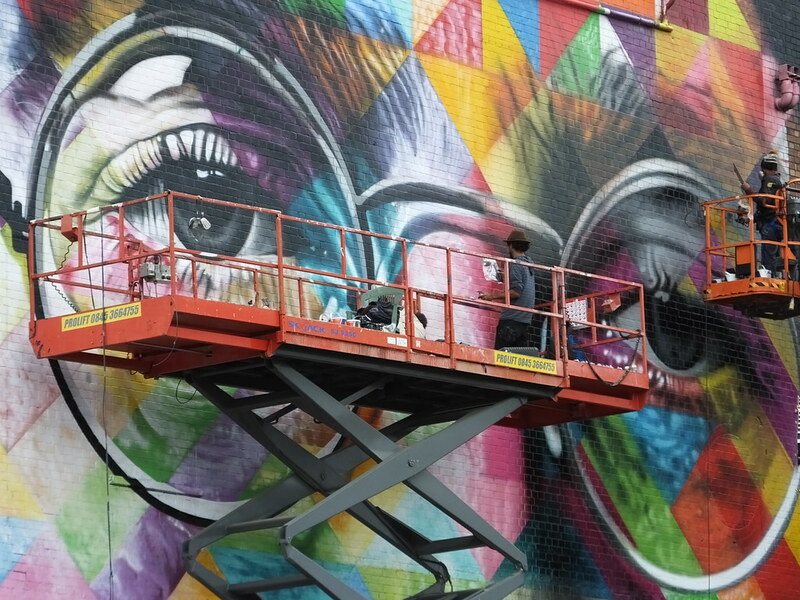 When you first glance at huge pieces of work like this you can think it’s complete and already a work of art but the artists persevere and battle many things, including the weather, and take their work to another level – here the constant transformation is amazing. 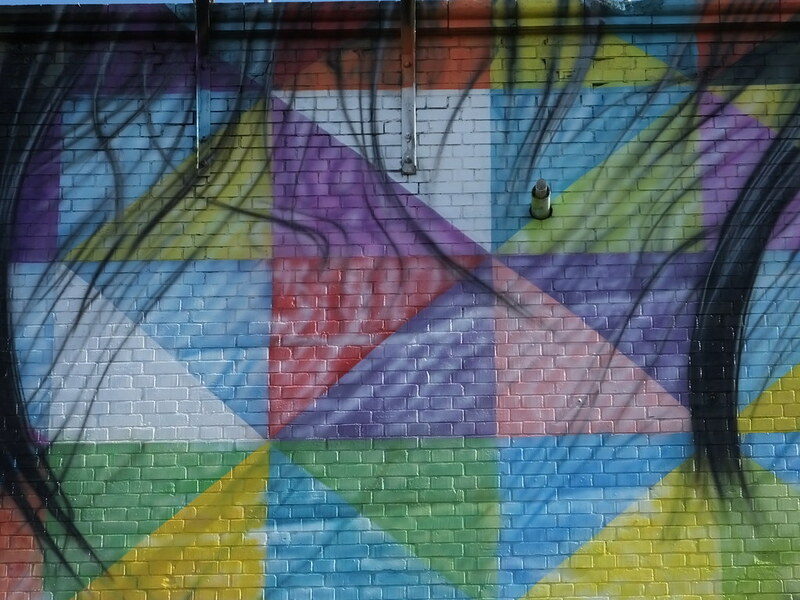 Even the shadows added to the piece too!